Last week I got together with a new friend, Shelly, for a walk. When she learned more about the work I do with new and expecting mothers, the worry poured out of her. Shelly’s sister-in-law (SIL) had a baby 8 months ago, and she’s concerned about her. She's tired, irritable, incredibly anxious and doubting herself all the time (Yes, these are also symptoms of PPD--scroll to the bottom of this page for other symptoms you may not know about). Specializing in Maternal Mental Health, it’s par for the course to hear about sisters, friends, daughters and co-workers who are struggling with Postpartum Depression. One in seven women deal with Perinatal Mood and Anxiety Disorders (PMADs), so really, it’s no surprise to hear about it so often. The thing that routinely does surprise me, however, is the hesitation many people share about approaching those they love with their concerns. This was Shelly to a T. She felt close to her SIL, but was apprehensive about recommending that she seek out some support. The more we talked the more I understood what was getting in Shelly’s way of reaching out. Shelly's the mom of a toddler and seems to have it together-- or together enough. She has a stable partner, family close by, a new business she’s passionate about; she’s confident and happy in her life. Her SIL, on the other hand, lives far from family and is further isolated by her husband’s current deployment with the Navy. She has a history of depression and other risk factors associated with PMADs. By the end of our walk, I had a pretty clear grasp on Shelly’s hesitation to reach out to her SIL. She didn’t want her to feel judged, or less-than, by addressing concerns about her ability to cope with the adjustment to motherhood: A transition that has come fairly easily for Shelly. Shelly was also concerned about providing the right kind of support. With a history of depression, it was routine for family to jump in to “help” her SIL, and make everyday tasks easier. Her depression would subside for a bit and then the pattern would repeat. While a supportive family can be ideal in helping someone through their recovery, professional treatment may still be needed to address issues that may be contributing to the depression on a deeper level. Shelly wanted to help but she wasn’t sure how to do so effectively. 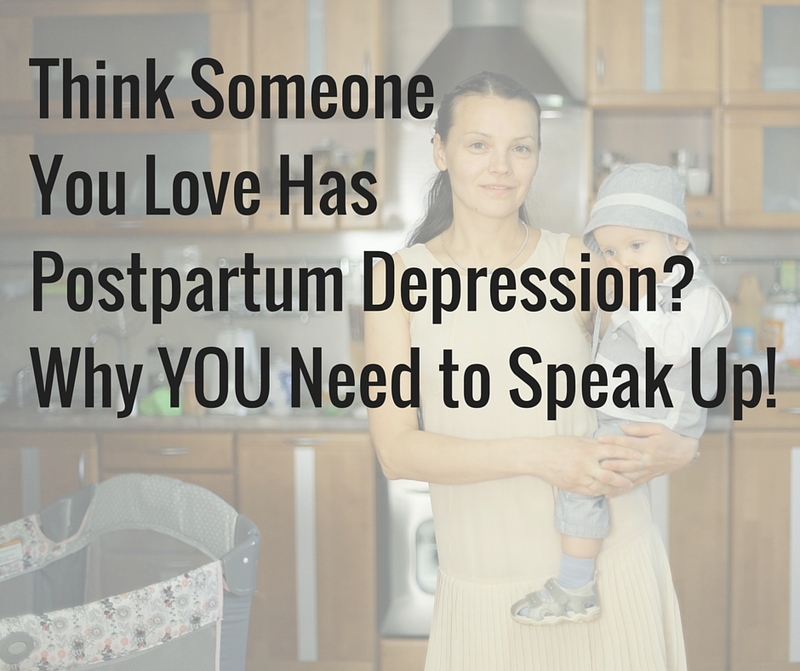 If you don’t speak up, the person you love might not get the help they need! Many women suffer in silence. Too many. More than 20 percent of moms are diagnosed with PPD. However, a recent study by BabyCenter shows that 40 percent don't seek the medical help they need due to feelings of embarrassment, guilt and the expectation that they can get over it without professional help. There are many risks to mom and baby if postpartum depression or anxiety goes untreated. Also quite common is that women don’t even realize that what they’re experiencing isn’t normal! Just today I saw a third-time mom who started to recognize in my office that she had probably struggled with postpartum depression with her first two children without knowing. Sounds unbelievable but it’s true. The messages that women hear about motherhood reinforce that it’s natural, easy. That yes, you may be tired, but that’s normal. There’s a lot of grey area and it’s not always crystal clear whether what you’re experiencing is a normal adjustment to motherhood or something more serious. So if you notice something doesn’t seem right in someone you care about—Say something! It’s important to be empathic, but it’s most important to be direct. Let her know that you’re worried about her; she doesn’t seem like herself. Let her know it’s normal, lots of women (1 in 7!) deal with PPD. It’s not uncommon for many women to go undiagnosed. Don’t let her slip through the cracks! Speak from your heart. Let your love and care shine through. If she’s struggling to care for herself or her baby, this is serious. Remember, she’s not choosing to be neglectful, she’s struggling. You know she wants the best for her baby, for her family. Help her get the professional support she needs. Make time for her. Once you connect her with people and resources she needs to improve her mental well-being, she will still need lots of support from people in her life who love her. She is vulnerable. Bring her food, go for a walk, watch her baby so she can take a shower. Keep her company. If you or someone you know is struggling with a Perinatal Mood or Anxiety Disorder, please reach out for support. PMADs are very treatable. Postpartum Support International (PSI) is a national organization that maintains a warmline and also list of trained providers specializing in Maternal Mental Health. If you’re in San Diego, CA, The Postpartum Health Alliance is our local chapter of PSI and a wonderful resource.